Calling members of the opposition, much less the media “the enemy of the people” is an old Soviet trick, popularized by “Uncle Joe” Stalin. Who’s the enemy now ? 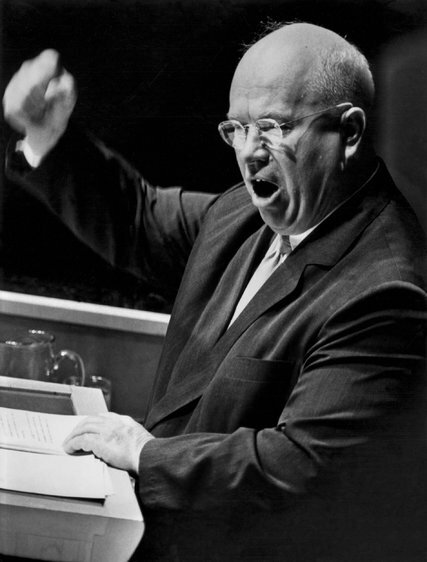 “The formula ‘enemy of the people,’” Mr. Khrushchev told the Soviet Communist Party in a 1956 speech denouncing Stalin’s cult of personality, “was specifically introduced for the purpose of physically annihilating such individuals” who disagreed with the supreme leader. It is difficult to know if President Trump is aware of the historic resonance of the term, a label generally associated with despotic communist governments rather than democracies. But his decision to unleash the terminology has left some historians scratching their heads. Why would the elected leader of a democratic nation embrace a label that, after the death of Stalin, even the Soviet Union found to be too freighted with sinister connotations? In Mr. Trump’s case, however, he is branding as enemies a segment of the American population — specifically representatives of what he calls the “fake news” media, including The New York Times. He has used the phrase more than once, including Friday during an attack on the news media at a conservative gathering in which he said that some reporters were making up unnamed sources to attack him. “A few days ago, I called the fake news the enemy of the people because they have no sources — they just make it up,” the president said, adding that the label applied only to “dishonest” reporters and editors. Hours later, Sean Spicer, the White House press secretary, barred journalists from several news organizations, including The Times, from attending a briefing in his office. Stalin, who took over as Soviet leader upon Lenin’s death in 1924, drastically expanded the scope of those branded as “enemies of the people,” targeting not only capitalists but also dedicated communists who had worked alongside Lenin for years, but whom Stalin viewed as rivals. He has also gone one step further than Chinese and Khmer Rouge communists in Cambodia, who generally preferred homegrown insults to those imported from the Soviet Union. Mr. Short, the Mao and Pol Pot biographer, said Chinese and Cambodian communists, all fiercely nationalistic, rarely if ever used “enemy of the people” in domestic political struggles because it was an alien import. Instead, Pol Pot attacked enemies as “ugly microbes” who would “rot society, rot the party and rot the country from within,” while Maoists coined insults like “the stinking ninth category” to denounce experts and intellectuals.